Before you head out shopping, understanding your own finances and the bills or expenses you are required to pay each month will help you to create a spending budget regardless of what you are looking to buy. Planning your finances ahead of time and knowing when specific bills are due is highly recommended if you have difficulty staying away from impulse purchases or sales. In this instance, the cliché holds true: Knowledge is power. Set a budget each time you plan to shop. Create a list of the necessities, and do not deviate. Know how much you have available to spend and stop yourself from potentially overspending or purchasing merchandise or food that you do not need. Reward a dedicated savings effort by contributing a small amount to a ‘Wish List fund’. With a controlled amount dedicated to the purchase of unessential items, you can satisfy your occasional sales cravings and maintain a disciplined financial front. Set a goal for how much you plan to save each week and stick with it. The more positive habits you form financially, the easier it will be to keep yourself balanced with the money you do have. When you believe you may encounter sales while you are out shopping that are hard to resist, consider shopping with cash only. Take the cash you have budgeted for and avoid using credit or debit cards to pay for splurges, even those at a discounted price. Instead, using cash will allow for minimal swaying of any budget you have set in place. “Forgetting” your credit cards or physically cutting them up and throwing them away will also stop you from making impulsive shopping trips and purchases while you are out, even during a hot sale. Keep up with your bank accounts and your household or individual finances at all times. Enroll in online banking and stay actively involved in every purchase or online bill you pay to ensure you are saving money and you have enough to cover all living expenses. That BOGO shoe sale or One-Weekend store-wide extravaganza sounds fun and exciting. Making a purchase for less than perceived value gives us the endorphin rush of ‘VICTORY!! !’, but with a little planning and discipline you can make sure your budget stands the test of ‘limited-time’. Author Bio: Jennifer Willard is a new blogger in the financial community. She writes for her own personal finance blog, Crayons & Coins, about her journey out of debt and life as a mother and spender. Good tips! We generally are pretty good about not giving in to temptation when shopping. If we are tempted we simply take cash as you can only go so far with it and it “hurts” more to part with it. We mainly just stick to our budget and use a credit card to earn rewards points. I tried “cash-only” shopping last week, John. I think you’re right – it’s harder to part with! I might stick with the card for gas points and online shopping, but beyond that it’s back to cash! Grocery shopping is tough – there’s so many low-risk deals, it’s hard to keep to your list! Unlike my mother, I’ve never really felt the urge to take advantage of sales. I’m more inclined to see sales for what they truly are: marketing efforts designed to get customers to spend more. Case in point: I was in Hot Topic a few weeks ago to buy a gift. They were having a buy-one-get-one-half-off sale. I did get a second item for use as a gift I would have otherwise needed to purchase this summer. That was saving $5 that I would have needed to spend otherwise. Ahh, Edward – I need you to come shopping with me! It’s hard to step back and see that logic, but it’s impossible if you don’t remove the “pressure” as you described. good advice! many people get so overwhelmed when something is on sale, and ends up buying a lot of “crap” that they really didn`t need. Thanks! Marketers are incredibly skilled at creating pressure to buy. I always pay on cash when shopping on budget. This makes me easier to control myself from spending more than what is on my budget. I like the idea of setting aside a wish list fund so as not to left behind also what I want to get for myself that are not really that necessary or urgent to have. Cash is where it’s at, Jeremy! You can go old school and put any coins you get back from purchases towards savings… or maybe that’s where the wish list fund gets it’s juice! I think the best way to avoid overspending especially when it comes to sales it’s best just to stay away from places. My wife and I use to go to the mall every weekend but then over time we realized if we would just stay home we ended up saving a lot more because most of the stuff we bought wasn’t a real need but rather a want. Chris, if only we all had your strength and resolve – Retailers would be pulling their hair out! 🙂 I’ll add that it helps to cut television out of the equation, commercials can plant a “gotta have it” time bomb! Great tips, Jennifer. There is nothing like a good sale that puts in the mood to spend. For me, a firm list helps and I try to avoid extra browsing otherwise I might find something tempting. I also keep my goals top of mind, so I can say “no” to whatever I might stumble on, knowing that I am saying “yes” to my goals. I agree, Shannon – I’m lost without a list! I’ve also heard from friends that they set a time limit for non-essential shopping, although I’ve never tried that myself. you can’t overspend cash! Great tips here. I’m an advocate of knowing your spending limits and doing research before even walking out the door. A great add, Jacob – researching before-hand (pre-search?) cuts down on browsing time in the store. If you’re making a big purchase, like a television or car, knowing what you’re looking for before-hand limits the power of the seller or advertisement. 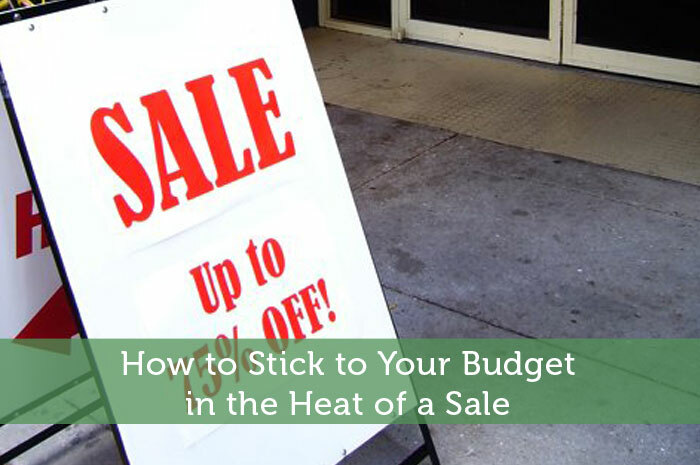 Shopping on a budget is quite difficult especially when you see the products on sale. These are good pointers. It is really necessary to fix a budget so we don’t overspend. Your advice to shop using cash is also a great idea. There is less chance of buying more than what you need if you do not use credit cards. My favorite is shop with cash. The truth is there’s waaaaay more debt than there is real money out there. The name of the game is to get people to transfer their money to YOU not spend your cash. I take advantage of sales when the TV or gadget I’ve been keeping my eyes on are on sale. That would make me really happy. Good advice. If I need something, I will check it is on sale first but have been trying really hard lately to make sure that a sale price doesn’t tempt me to think I need it. Using cash is always a good way to control it for me. Great tips. One of the things I use to do when we wanted to buy something was leave my wallet at home go look at it make the decision without impulse, go back get my wallet then purchase the item. We in the family buy everything with credit card. We don’t buy what we don’t need. We only have one account. Your suggestions for ‘Wish List Fund’ don’t apply to us. We don’t have wish list. But all your points are well taken. Folks who have problems with never-ending shopping should follow the article. It’s very well written. These are great tips. I try to always shop with a list so that stick to the items we need. If there is something that catches my eye, although I am pretty good ad going through my “need” vs. “want” checklist in my head, I typically take note of it and force myself to sleep on it. If I still want it the next day and am willing to make the trek to the store again, I’ll go if not… well I guess I didn’t really want it that bad after all. My GDI partner’s trick is to actually put it in her basket and walk around the store with it. She then decides before going to the cash if she still needs/wants it. I’ve seen her put it back more often then actually making the purchase… now that’s discipline!